Thomas Hardy: The Convergence of the Twain. 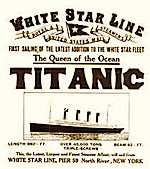 First published in The Fortnightly Review June 1912 to commemorate the sinking of RMS Titanic the night of 14-15 April 1912 with the loss of 1512 lives. Republished by The Fortnightly Review on the 100th anniversary of the disaster. More: Harold Bloom’s comments on ‘The Convergence of the Twain’. This Fortnightly Review article is filed under the following rubrics: Archived content, Chronicle & Notices, Poetry & Fiction. Publication: Saturday, 14 April 2012, at 23:40.